Greenside’s Employee of the Month for May is David! To celebrate, we asked him to take our Stoner Survey. What is your favorite word for weed? Absolutely love getting slapped in the face by a really heavy indica! Would you rather smoke solo, in a large group or at a party? Where would your dream sesh take place? What is your favorite stoned activity? How do you like to consume cannabis? What do you want to learn more about in relation to weed? 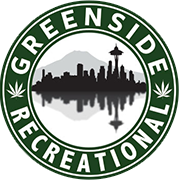 What is your favorite Greenside product? What is your favorite part of being a budtender?